Each year we wait. We count the days, watch the weather, complain, wait longer. Our patience stretched thin by the cold and by gray skies that are slow to yield to clear blue. Then suddenly, at last, we are surrounded by green. I can never keep up; never find time enough sketch or paint it all. Still, this year as in the past, it is a pleasure to try. Tips & Techniques– The window for capturing spring ephemeral wildflowers is very short– miss it and you have to wait a year. This page records some of what I saw during hikes on April 29 and May 6. The second walk was challenging because it was raining. Determined, I discovered that I could hold an umbrella and sketchbook in one hand and my pen in the other. It’s a new technique for me — not bad, but I’m not quite sure I’d recommend it. 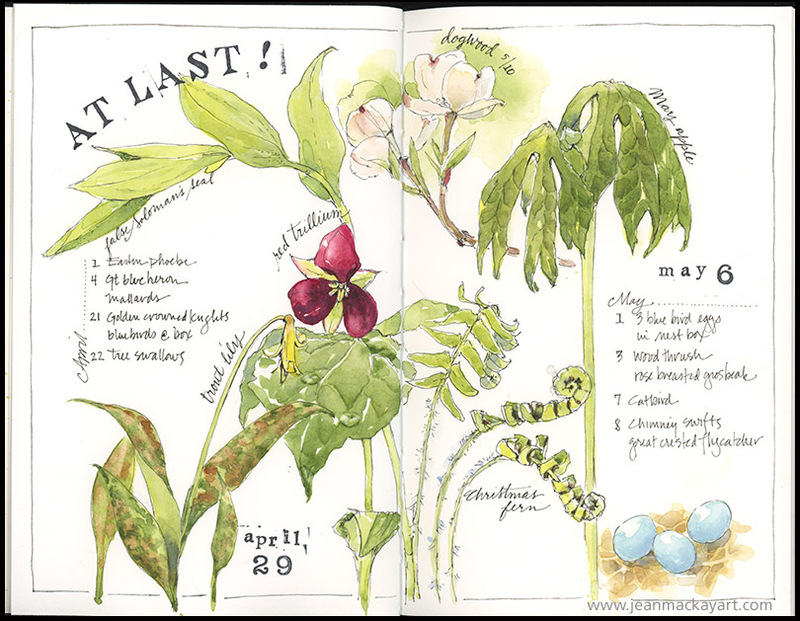 Spring Gallery- It’s fun to look back at prior years and compare sketches and dates.